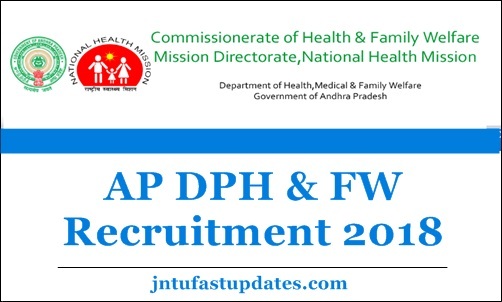 AP DPH & FW Recruitment 2018: AP Commissionerate of Health Family Welfare has released recruitment notification of 1171 civil assistant surgeons posts on regular basis – 2018 under the control of the director of public health & family welfare. Applications are invited from the eligible candidates to the posts of the Civil Assistant Surgeons in Primary Health Centers under control of the Director of Public Health and Family Welfare, Andhra Pradesh, Gollapudi, Vijayawada and CAS under the control of the Director of Medical Education, AP, Vijayawada on Regular basis. The minimum and maximum age shall be reckoned as on 01-07-2018 with the relaxations allowed for reckoning duly the maximum age limit as per rules. The candidate should not have completed (42) years of age as on 01-07-2018. Candidates should have passed MBBS Degree examination or its equivalent included in the Schedule –I of the MCI Act, 1956 as amended from time to time and from a College recognized by the Medical Council of India. Each application must be accompanied by D.D. worth Rs. 500/- (Rupees five hundred only) obtained on or after 26-09-2018 and prior to 25-10-2018 payable at Vijayawada drawn in favour of Director of Public Health and Family Welfare, A.P., Gollapudi, Vijayawada. The applications without fee shall be rejected summarily. Candidates should obtain the Application Form from the web site www.cfw.ap.nic.in of the Director of Public Health and Family Welfare, Gollapudi, Vijayawada. Please use only the application form downloaded from web site. The applications submitted in other formats must not be considered and those will be rejected summarily. The filled in applications can be submitted to the Director of Public Health and Family Welfare Gollapudi, Vijayawada on or before 25-10-2018 at 5.30 P.M. The applications received after 5.30 PM of 25-10-2018 are rejected summarily. For More Details see the Notification below.